Mother Toddler is actually the implementation of the ISP programme. In a nutshell, it is ISP in action. It is all about learning through fun, play and dance. 1. It is a one-year programme in which parents enjoy with their little children (of age 6 months to 15 months) for 1 hour 15 minutes, 3 times a week, at the school. 2. The children are also exposed to a lot of physical activities for their Gross Motor Development. 3. Special attention is given to needy students in academics as well as in personality growth. 4. Mother Toddler is the joy of being totally with your child, giving the best to your child and becoming a child yourself. 5. Here mother learns behaviour skills (how to behave with child), and the child also learns sanskar. After delivery, the mother feels completely lost. She feels emotionally weak, physically drained and mentally tired. Though she wants to help with the development of her child, and has big dreams for her baby, she doesn’t know how to realise those dreams. What does she gain after spending 2 hours at Mother Toddler? She will learn how to heal her body physically and mentally. She fill find that, unbeknownst to her, her own emotional development is taking place. Her body will get into shape again, and her energy level, vigour and vitality, and happiness will get enhanced. Her child’s IQ (Intelligent Quotient) will hence be augmented with EQ (Emotional Quotient) support. When the mother is playful and happy, the child can learn everything very quickly. Behaviour skills are imparted to the mother on a daily basis on how to behave with child, the husband, relatives and in-laws. Training is also given on how to develop her own five senses as well as the child’s five senses. Flash cards and Glenn Doman techniques are also provided for developing child language and mathematics. Everyday celebrations and Nature field trips are also organised. How to handle the child’s tantrums and how to divert the child’s attention from the tantrum to a playful mood are also taught. The tantrums thrown by children include food tantrums arising from notorious food habits. 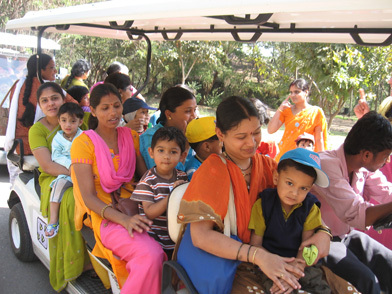 Many pre-schools across India got inspired by our concept of Mother Toddler and introduced the same in their offerings.